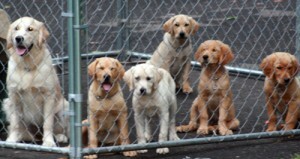 Another popular source for finding a new puppy or dog is the animal shelter. This is the most politically correct choice for many of us. However, for many of you, I wouldn’t recommend it. About a week later my niece heard a blood-curdling scream from the living room. As she ran into the room she saw this large dog (from the finest background) with her small son’s arm in his mouth shaking him from side to side. The dog is now back in a shelter and the family is somewhat traumatized by the whole ordeal. You can bet their next family pet will be a hamster or maybe even a pet rock. I purposely left my usual wit out of this section to drive home a point. If you have young children, bringing an adult dog into your house is very serious business. Do not leave unsupervised children alone with a dog you don’t know inside and out. This is not a story unique to animal shelters. It could be from a newspaper ad, an online rescue group or a stray dog that shows up in your backyard. If you’re not sure of the dog’s background, move on down the road and keep looking, you can always meet Oprah later. Can you find a good dog at a shelter? With a little homework and some time looking, of course you can. If you’re an adult household or have older children, I don’t have any problem with you picking a shelter dog. If you have young rug rats running around your house and you like them, I would be cautious. In our next article we will look at both backyard and professional breeders.